After my Luxury Dinner Party post, I received a few questions about preparation that I thought would make for a fun follow-up post. This was the first time I hosted a Thanksgiving meal and I admit I felt quite frazzled and overwhelmed at the thought of everything I had to prepare. I had flops, fails, kitchen disasters, gray hairs, long clean ups, mini breakdowns, you name it. You can think of me as your guinea pig who tested everything out for you. I’ll take one for the team if necessary! I am a strong believer in prepping ahead of time and I have nothing against making use of the freezer whenever possible. 1) I made Wedded Bliss Soft Ginger Cookies and promptly froze them. 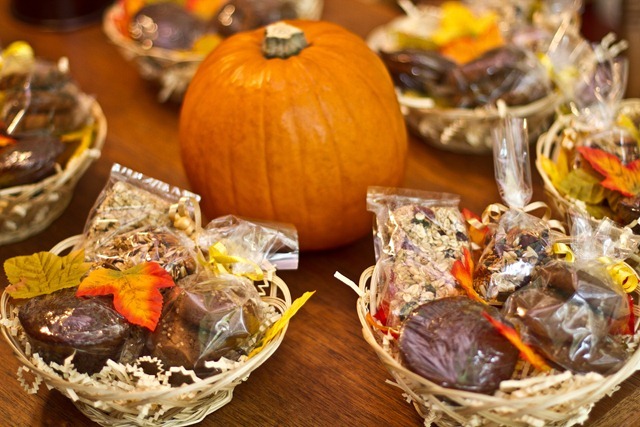 To freeze them, I double wrapped them in saran wrap and placed them into sealed containers. They were fresh as ever when I took them out on Friday. 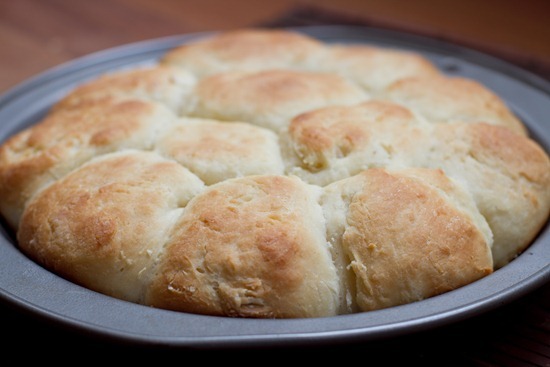 2) I also made Fluffy Pull-Apart White Dinner Rolls. I also promptly froze them. Contrary to common belief you CAN freeze bread if wrapped very carefully! I double wrapped the entire lot (minus two that I ate!) and stuck them in the freezer and hoped for the best. I was delighted to find that when I defrosted them on the counter on Saturday afternoon they were as fresh tasting as they were when I wrapped them up. So on Day 1, I checked off cookies and rolls. Progress. 3) First, I made the Vegan gravy on Thursday. I adapted the recipe from Eat Drink & Be Vegan Cookbook. It is packed with flavour, and it’s by no means a traditional tasting gravy. After making it and allowing it to cool, I put it in a container and placed it in the fridge until Saturday. Just before serving the main course, I took the gravy out, stirred it, and heated it up for a minute or two in the microwave. Presto. 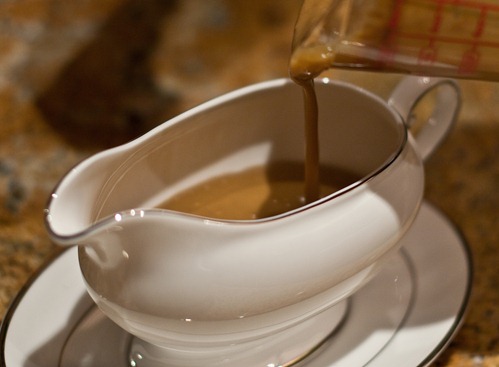 Note: I now recommend a new recipe – my all-purpose vegan gravy recipe below! 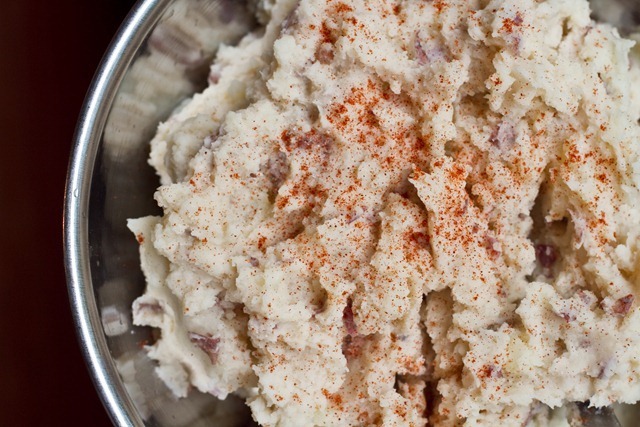 This easy vegan gravy has an incredible savoury flavour, and it's the perfect topping on my Cauliflower Mashed Potatoes, roasted sweet potatoes, and more! In a medium pot, heat the oil over medium. Stir in the onion and garlic. Saute over medium heat until the onion softens, about 4 to 5 minutes. 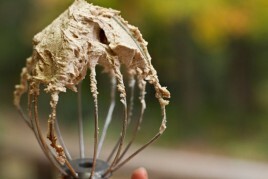 In a medium bowl, whisk together the broth and all of the flour until smooth. Pour the broth/flour mixture into the pan with the onion. Stir to combine. Stir in the tamari, nutritional yeast, and pepper. Bring the mixture to a simmer over medium heat, whisking frequently, until the gravy starts to thicken. Reduce heat if necessary if the gravy starts to stick to the pot. Transfer the gravy back into the pot and increase the heat to medium. Add in the salt and vinegar (if using). Keep simmering over low to medium heat until the gravy thickens to your liking. 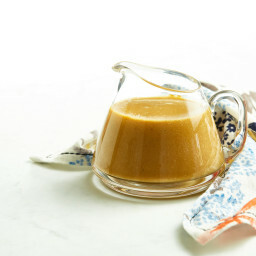 If the gravy is still too thin, whisk together 1 tablespoon of flour with 1 tablespoon of broth in a small bowl and then whisk this into the broth. If it's too thick, thin the gravy with a touch of broth. The gravy thickens a bit as it cools. Store cooled leftover gravy in an air-tight container in the fridge for up to 3 days. * Make it soy-free: Feel free to replace the tamari with salt, and add to taste. Adapted from Eat, Drink, & Be Vegan. 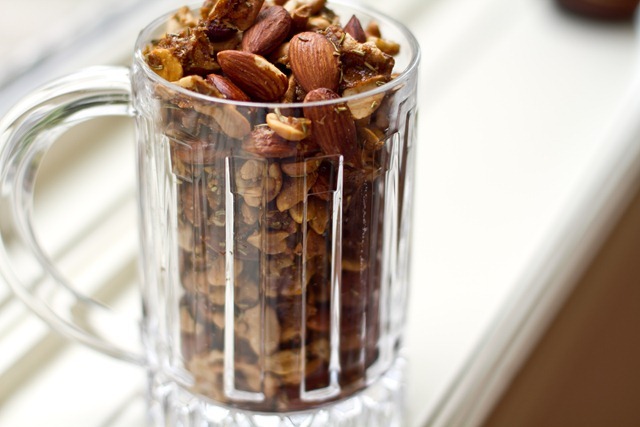 Directions: In a blender or food processor combine all ingredients and puree until smooth. In a pot on medium to high heat, add mixture and bring to a boil. Reduce to low and stir frequently to thicken. Remove from heat and serve. Add additional agave, water, or vinegar if needed to adjust taste. 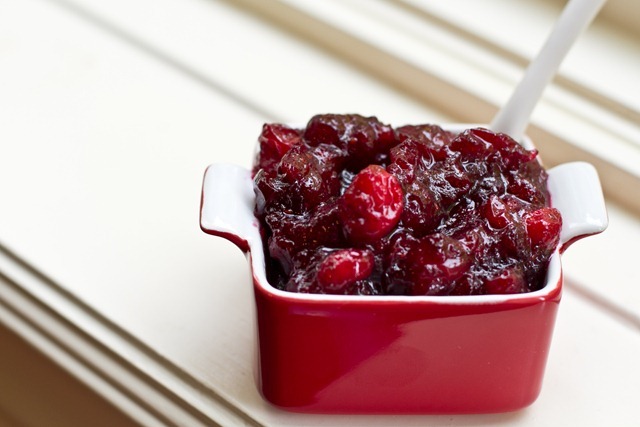 4) Next I made the Cranberry Sauce which was super easy. Place in container once cool and into the fridge. Remove from fridge about 30 minutes or so before you need it. Can be served warm or cold. Adapted from Eat Drink & Be Vegan. Directions: In a pot on medium-high heat, combine the ingredients and bring mixture to a boil stirring occasionally. Once boiling, reduce heat to low and cook for about 15 minutes stirring occasionally. Once sauce has thickened, taste test, and add vinegar is desired. Serve warm or chilled. 5) Then I made the Twice Baked Bar Nuts! Bar nuts are awesome because you don’t have to worry about if they will stay fresh. 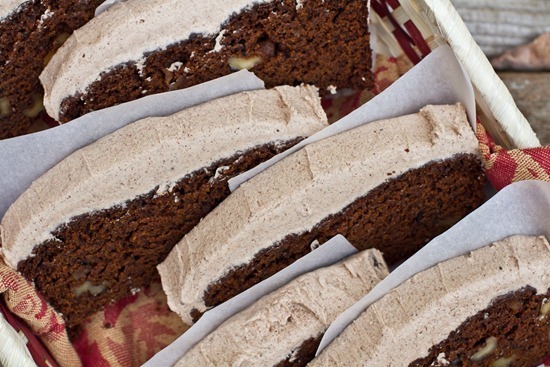 6) The last thing I made on Thursday was the Pumpkin Gingerbread with Spiced Buttercream. Note that I didn’t frost the gingerbread with icing until Saturday. After the gingerbread cooled, I double wrapped it and yes, you guessed it, popped it into the freezer until I removed it on Saturday morning. I stored the frosting in the fridge and I took it out 1 hour before I wanted to frost the gingerbread so the frosting could come to room temperature and be easier to spread. That concludes Thursday prep work! Luckily these recipes made up my blog material for the entire week or I wouldn’t have been able to fit it all in. 7) I prepped the This Ain’t Grandma’s Sweet Potato Casserole, but I did not cook it until Saturday. I simply prepped everything, put it in the casserole dish, and then popped it into the fridge. On Saturday, remove it from the fridge and allow it to come to room temperature before cooking (you don’t want to crack the casserole dish from extreme temperature changes…trust me I have done it before!). I also added vegan marshmallows during the last 5 mins of cooking. 8.) I prepped and pre-baked the Walnut Loaf. I didn’t cook it the entire amount of time because I knew I would be heating it up just before serving for dinner, so I cooked it about 80% and then cooked the rest of it, just before I served it on Saturday so it would be hot and crisp. This walnut loaf was good, but I would not serve it without the vegan gravy. The vegan gravy made the loaf. I also added a glaze on this loaf from the Clean Food Cookbook. 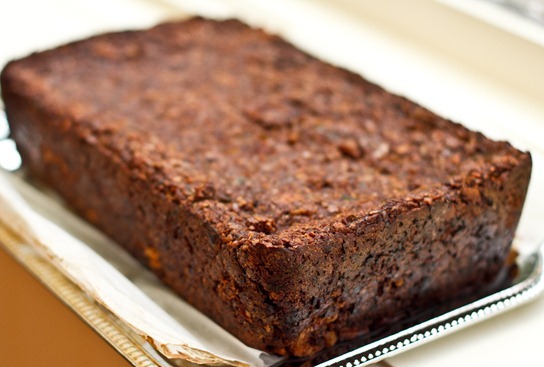 This link also has a recipe for another type of Walnut Loaf that has received great reviews. I think I will try that one next time. For the recipe I made, see my document attached. 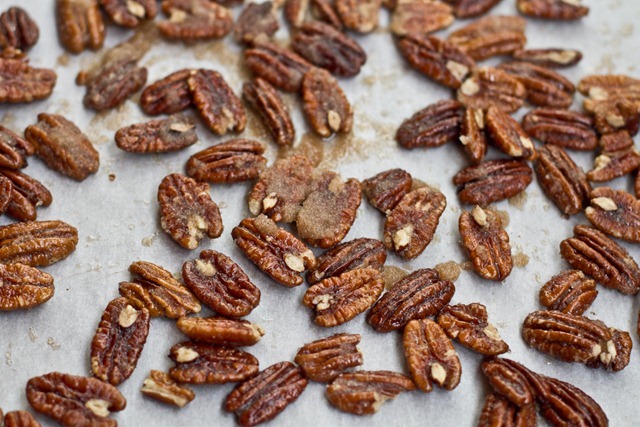 9) Next up were the Candied Pecans! Recipe here. My first attempt was a bit of a fail. I also didn’t follow the steps of the recipe correctly. Note to self: Do not tell yourself you are simply leaving the kitchen for a ‘minute’ when you have precious and vulnerable nuts in the oven. They will incinerate and a tiny piece of you will die inside. My entire house also reeked of smoke! ahhahah. FAIL. 10) I cooked the potatoes for the high protein garlic mashed potatoes. Once the potatoes cooled off, I placed them in the fridge and finished making them on Saturday. 11) Pumpkin Pie brownie Cupcakes were made. Yummy. On Friday night, I also hit up the Dollarstore and grocery store and prepped the goodie baskets. Inside each goodie basket I included: 3 Wedded Bliss Soft ginger cookies, a Glo Bar, a Pumpkin Pie Brownie Cupcake, and Power House Glonola. Saturday October 2nd: THE DAY OF! I admit, this day is a huge blur. I got up around 6am and did not stop prepping food until my dinner guests arrived at 5:30pm. It was a long, crazy day. I strongly suggest seeking out help if you are going to tackle a Thanksgiving Dinner! After a week of squeezing in prep whenever I had free time, I was totally wiped out and had it not been for the challenge I would never have made it out alive. As soon as I got up, I removed everything from the freezer so it could defrost…rolls, gingerbread, etc. I also removed things like the Sweet Potato Casserole and cooked potatoes from the fridge so they could come to room temperature. Next, I baked the Pumpkin Pie Brownie in a Pecan Crust…Recipe here. I also baked the Sweet Potato Casserole, finished the mashed potatoes, prepped and roasted the veggies, and finished cooking the walnut loaf as it got close to dinner time. It was really crazy trying to time everything and what I realized is that you can never time everything perfectly. There is no such thing. At least not in my world! Just do your best and that will be good enough. Don’t forget all the recipes from the dinner party can be found here. I also set the table while I waited for things to cook. Dollarstore baskets and napkins– The napkins were 25 cents each!! The place settings were my favourite part. Of course, Martha came up with the idea…not me. We also dug out our wedding china from boxes for the very first time. ;) Who knows how long it would have stayed in the box if it wasn’t for this challenge. A crazy and wild week filled with a healthy dose of trial and error and a determined spirit to overcome any obstacle. I still can’t get over how incredible your dinner party was! Congrats to you – that is a huge success! Angela you are amazing! Thank you so much! 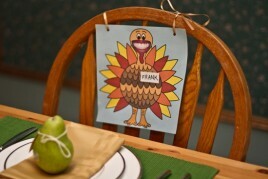 I will be re-creating this for my own Thanksgiving. When are you going to publish a cookbook?!?! I’m not sure that’s legal in the food blog world to have that many knock out photos, delicious beyond comprehension recipes as well as a fantastic write up. I was completely transfixed on those mouth watering pictures. 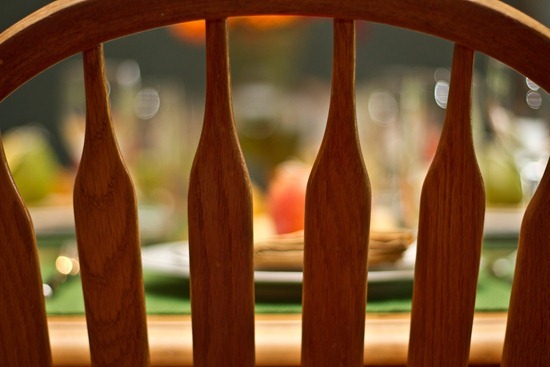 Then I get to your table setting and….well, speechless. Perfect! this is undoubtedly a success !! It really looks like the dinner party was a huge success! I especially love how you showed where some of your inspiration came from. Not everyone has to be as creative as Martha as long as they have access to her website! The amount of work you put into this is SO Thanksgiving, but better! From the decoration to the food, you definitely rocked this one. I think I see another Foodbuzz reader’s choice coming your way! 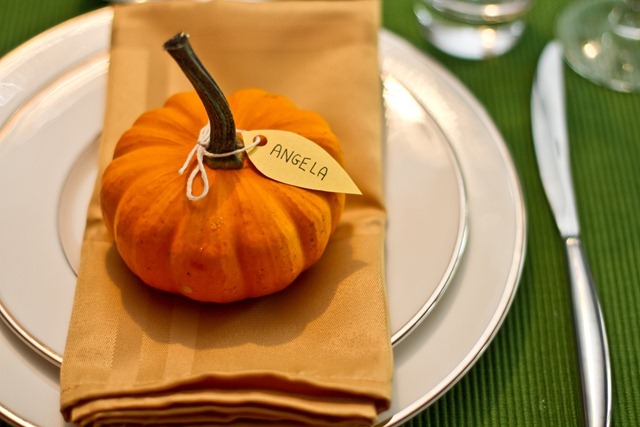 This seriously looked so perfect…it’s inspired me to host a pre-Thanksgiving dinner of my own! Not sure if it will happen, but if it does, I can only hope it turns out half as well as yours did. Looks flawless! That’s a huge undertaking–it came out great. I love the tablescape, too. It’s understated but so festive! Everything looks excellent! This will be the first year I’m cooking Thanksgiving (with the BF’s help of course). We’re having an Orphan Thanksgiving — basically inviting friends over that don’t have family nearby. I hope I can pull it off! I will try these recipes for sure. i’m dizzy just thinking about all of this. good work ang. The thought of hosting a dinner party like that scares me because I’m terrible at time management! :P Kudos for pulling it off so smoothly! Angela, you are so amazing! What a lot of work you put in!! 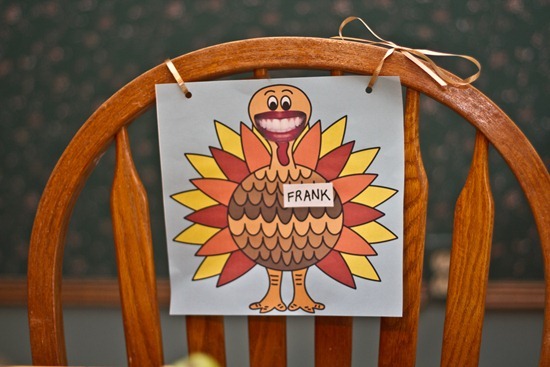 I only just noticed Frank’s giant pearly-white smile – thanks for the giggle! you really have influenced me to have a vegan thanksgiving before my family thanksgiving (or bring some of these goodies)! love all of this! Thanks for the tips too! You did an amazing job with the dinner party. Question: I have noticed that a lot of your recipes call for blackstrap molasses, but I really don’t like any molasses and can almost always taste it in any food that I use it in. Are there any alternatives? You will have to ask for more help next time…though you did do a more than marvelous job on your own! I sometimes find it hard asking for help, especially when it comes to food prep…I guess I get a little protective. You’re right that the timing can never be perfect, but a trick I use is to work backwards! That is, if you know you are serving at 6, count backwards from there to figure out what time everything needs to go in the oven. Then use that to figure out what time you should turn ON the oven, and back and back as far as you can. I agree with doing as much as you can in advance! I was prepping a full week in advance when I did Christmas for 21 people last year. Great tips, especially with the holidays coming. Ange, the blow-by-blow here was really helpful. Every time I cook multiple course meals, I worry that my timing is off. I’m always afraid the warm dishes will get cold too quickly or that I’ll muss up in the oven…I think what this really shows is that with lots of pre-planning there’s not *too* much to worry about in terms of everything coming together for a fab end result! I’ve burned nuts in the oven before too. Been there, done that. It ain’t pretty. And it doesn’t smell good. your table decor is very simple and pretty, me likie!! First of all…Frank is awesome! Your dinner party was gorgeous! 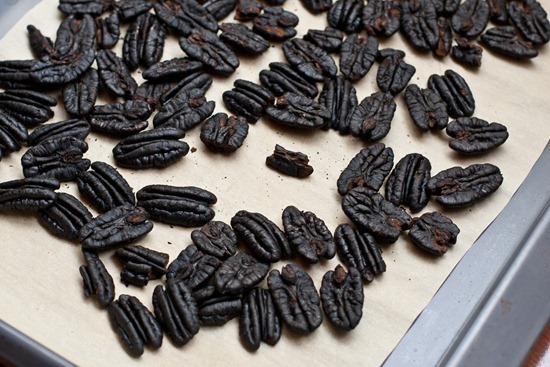 And thank you so much for showing the incinerated nuts :) One kitchen disaster per meal prep is status quo in my house so I could definitely relate! Thanks for the info! I think it is great that you can laugh at your kitchen mishaps. I tend to place too much pressure on myself due to underlying cooking insecurities I have, and get too upset when there are inevitable flops in the kitchen. Far better to laugh it off! All of this looks SO good!!! I need to throw a Thanksgiving dinner now just so I can make all of these recipes! your photography gets more and more spectacular every day, angela! Thanks for your detailed schedule! It is seriously so much work to throw a dinner party! Holy cow!! …everything else looks awesome though! Amazing. That dinner party took a LOT of work! But it looks like it was well worth it, and you definitely had it under control :) I think I’ll make that vegan gravy for Thanksgiving this weekend- looks tasty! I made the pumpkin gingerbread yesterday, and oh my stars it is fantastic! Love it. Frank is by far my favorite part of the dinner table :) I love his cheesy grin! Angela this post gives me hope that maybe one day I too can host Thanksgiving at my house — and what I like is that you made stuff ahead of time — I wouldn’t want to spend one day ALL DAY in the kitchen — better to break it up to be able to take your time with each dish and make it perfect! so that is how you did it! It looked like perfection! The freezer is the best invention ever, huh? 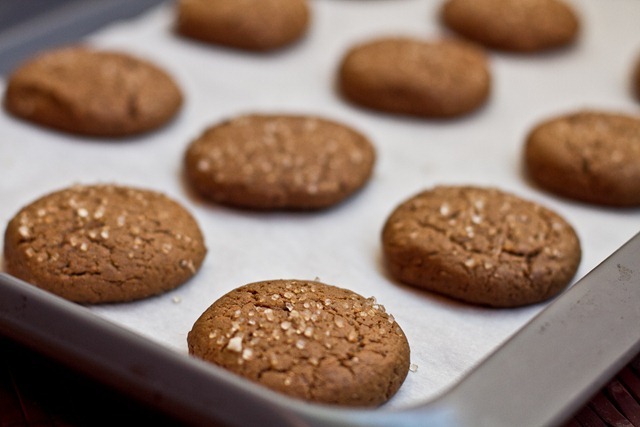 Your ginger cookies looked so good I saved the recipe to make them sometime soon. What are and where can you find Vegan marshmallows? I’m always afraid to freeze stuff – that’s good to know that cookies and bread freeze well and still taste fresh once it thaws. Fantastic, I can’t wait to make some of your vegan recipes for Thanksgiving and share with my family! Your dinner party still blows my mind! Amazing!!!! Love the prep work tips and tricks. Whenever possible, not just for special occasions, but for life in general, I always have things prepped in my frigde and ready to unwrap and serve, cook and serve, etc. 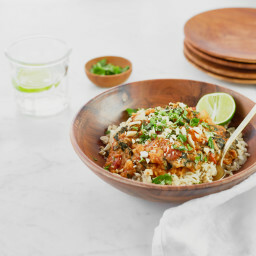 One never knows when all of a sudden a crisis is going to unfold from 4-8pm making any kind of dinner prep just not happening and so with something sorta pre-done and waiting, it takes the pressure off. Way off. Espi when a 3 yr old is begging for dinner. I am a total pre-prepping girl…juggling work + family + high raw vegan food = plan ahead! thanks angela, this step by step was really useful!! you put in a lot of time and energy!! it looks like it turned out great! Good Lord!! You deserve another trip to Paris after all that hard work!! :) Everything looks fantastic, and yummy!! Thanks for being so detailed so we can all do it too! wow that is a lot of hard work! but it looks gorgeous, from the food to the table setting. and i love how you make it more manageable by splitting the work up into different days. You are wonder woman! Thanks for sharing. I shared this link with the other editors here at SparkPeople. 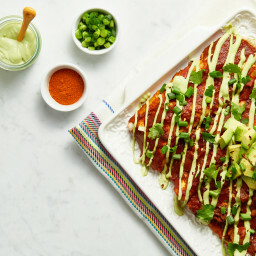 All three of us are vegetarian and can’t wait to try these recipes! Thank you so much for posting your recipes! I made the apple/squash dish for guests last week and it was a huge hit – and now I have a complete Thanksgiving meal for next month. Good luck with the food challenge – you got my vote! That all looks soo fantastic! 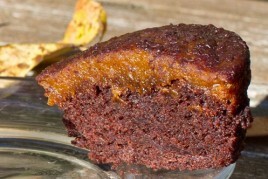 How do you store the pumpkin brownies? Do they need to be in the fridge, or just sealed in a container or plastic wrap? I applaud you and your incredible organization! Wow..everything looked amazing. I cannot wait to try..EVERYTHING:) Including the frank picture LOL! Wow, awesome! I loved seeing the dinner party pictures, everything looked delicious and your table setting was gorgeous, including Frank! Thanks for sharing the recipes, I can’t wait to make that gravy, sounds fantastic!! You are superwoman! The next vegan Marta Stewart maybe? I’m already flagging recipes to make for my own Thanksgiving!! This has to be one of my favorite set of posts from you! You did such an amazing job, and you can tell how much time and care you put into it. I’m sure the guests appreciated all the effort. Of the entries I’ve seen for the food challenge, your’s goes WAY beyond the rest. OMG!!!!! 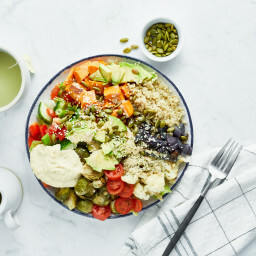 This meal looks delicious! 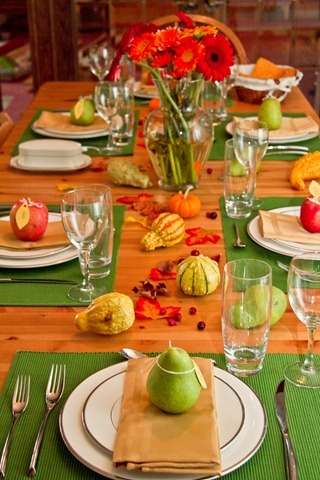 I love your tablescape, You are soooooo creative! wow what an accomplishment! looks like a lot of hard work. every thing looks amazinglky delish though. You read my mind! I was just going to ask if you could give us some kind a time line for the meal prep!! Thanks for sharing this! Very impressive and brave. Your guests were very lucky. p.s you’ve got something special going on with this blog – keep your motivation girl. I think I figured out what was going on. I think when I copied the recipe I forgot to write in PIE PAN in the places that said muffin tin. I, too, am interested in more details on baking the Pumpkin Brownies as a pie. The title infers that there is a crust, is that referring to the upper “crust” of crunchy pecans, or did you put a crust on the bottom. What did you use for the baking temperature and time for the pie? Ok ladies I think I figured out what was going on. I think when I copied the recipe I forgot to write in PIE PAN in the places that said muffin tin. Thank you! Trying it tonight! Thanks Angela – I’m all set to make it now – can’t wait! I’m super hoping you get this message this weekend… anyhow, I work for a magazine in Idaho (Meridian Central Magazine) and I’ve written an article that has to do with holiday party planning. Your pictures are GORGEOUS and perfect for this article! Is there any chance that we could use some of your pictures and give you full photo credit? 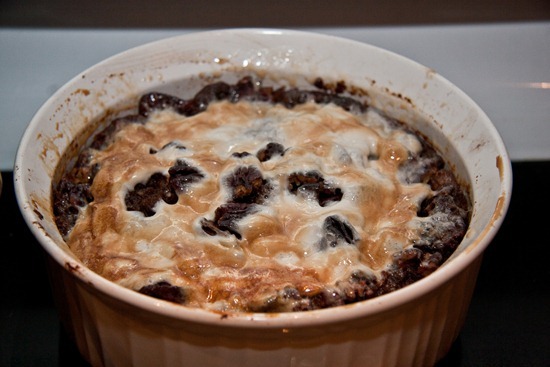 I would also love to reference your blog in the article for great holiday recipes. Please let me know if it would possible. We are slowly attempting to go vegan around here and I’ve loved your blog for years. I am trying out your shepherds pie with this vegan gravy today! I’m wondering if you’ve ever tried making the gravy in large amounts and freezing it in batches? I’m thinking that my life would be easier if I had ready to go gravy in my freezer :). Then I could throw together a nut loaf, or whip up some mashed potatoes and there would be gravy just waiting to make it a fabulous meal! Ok, here I go to make the gravy, I’m hoping it tastes as good as it looks! Hi Gina! I`m sorry I haven`t tried freezing the gravy before. If you try it out, let me know how it goes. Goodluck and thank you for reading! I just hosted a Rosh Hashanah dinner and had a similar few days of on my feet from morning til night cooking and prepping before hand. Asking for help is difficult, but get it where you can. If you can’t let go of the cooking, let someone else help with the clean up or running to the dollar store, etc. My teenage daughter swept and mopped the floor…I mean REALLY thoroughly mopped the entire house. Not only did I not have to do that, but suddenly I became a hero in her eyes “How do you do this every day? 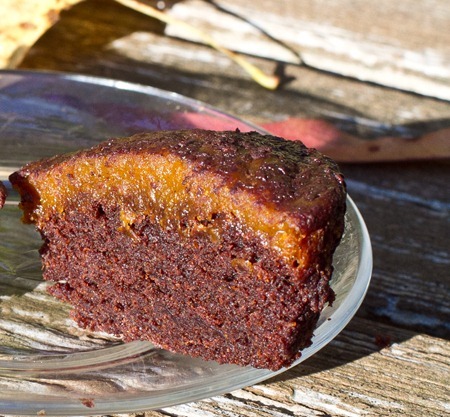 It’s exhausting!” So even when you delegate, you can still come out greatly appreciated in ways you didn’t expect :-) I have to say that all of the above recipes sound amazing, but the pumpkin pie brownie…OMG! We’re still waiting for cool weather to finally arrive, but I’m going to crank up the oven tomorrow for this one! 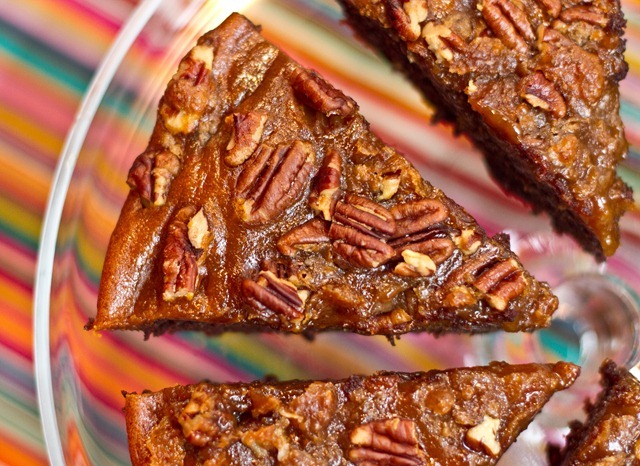 I love love love pecan pie and who in their right mind doesn’t love brownies? It’s a marriage made in culinary heaven!!! And the gravy sounds like its going to become a staple around here. I am worn out after (speed)-reading through your Thanksgiving prep – whew!! I have done so many of these that I know very well how much work it is and how unbelievably crazed it can make you. (At the end of the day, once, I was actually crawling on hands and knees.) What’s incredible is, the “day of” tasks don’t even sound like all that much to do – and I ALWAYS think that – and yet, it takes you working ALL DAY to get that meal completed. Kudos to you, my dear. Not many people have a clue what our dear grandmothers accomplished for us year after year. :) GRATITUDE. 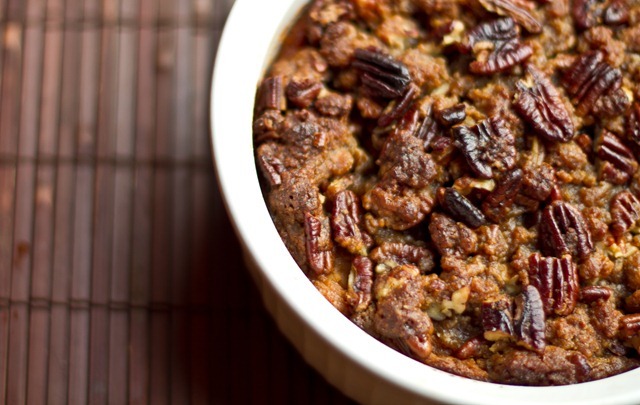 Your Thanksgiving menu is amazing and I can’t wait to try these recipes. I am just wondering if the recipe is correct for “This Ain’t Grandma’s Sweet Potato Casserole” as the topping calls for 1/4 cup of margarine. Margarine is not something that would normally be in your healthy recipes, and I was just wondering if it should be Earth Balance? Heather, it’s a spice that you can find in Indian grocery stores and sometimes in supermarkets. But if you can’t find it, you can leave it out. Have you tried freezing the gravy? I would like to make it for Thanksgiving this year and it would be much easier to make it at my home the weekend before and freeze it before driving 3-hours to my parents’ on Thanksgiving Day. I hosted Thanksgiving last year and made the gravy and even my VERY skeptical father approved! Hey Ashley, Im so glad you love this gravy! I’m sorry I haven’t tried freezing it before, but that’s such a great idea! I’m really not sure if it would freeze okay. I would suggest freezing just a small amount first and seeing if that thaws and reheats okay before trying a whole batch.